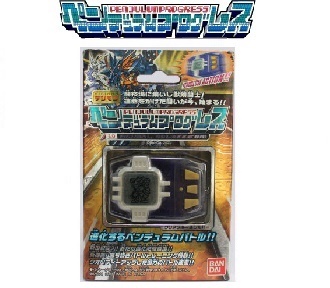 The Digimon Pendulum Progress (デジモンペンデュラムプログレス) is the third evolution in the series of the Digimon Virtual Pet. Three versions were released alongside the D-Scanners for Jogress compatibility. 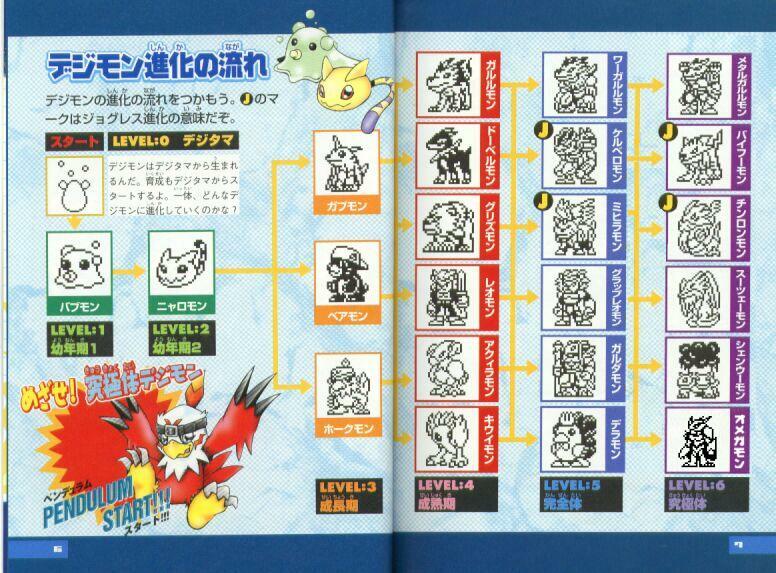 To obtain certain Digimon in the Pendulum Progress, you may Jogress with certain Digimon on the D-Scanner. Digimon Pendulum Progress 3.0 Animal Coliseum (デジモンペンデュラムプログレス 3.0 アニマルカーリシーアム) is the third version of the Digimon Pendulum Progress virtual pet. From any Adult Digimon: Train in Morning, 0-2 Care Mistakes, 60 battles. From any Adult Digimon: Train in noon, 3+ Care Mistakes, 30 battles. From any Adult Digimon: Train in night, 0-4 Care Mistakes, 30 battles. From any Adult Digimon: Train in night, 5+ Care Mistakes, 30 battles. From any Perfect Digimon: Train in Morning, 3+ Care Mistakes, 80 battles. From any Perfect Digimon: Train in noon, 2+ Care Mistakes, 50 battles. From any Perfect Digimon: Train in night, 80 battles, 60% Win Ratio. From MetalGarurumon X: Battle Evolution with WarGreymon (PenProg1). Battle with WarGreymon and win and MetalGarurumon X will evolve. – A Care Mistake is when your Digimon cries out and you fail to attend to it before it gives up. Your Digimon will do this when its hearts run out or when it’s time to turn out the lights. Waking the Digimon from sleep also counts as a Care Mistake. – If you do not have a high enough Win Ratio (but at least 50%) and the time has elapsed for evolution yet all other conditions are met, an extra 4 hours will be added onto your condition time. – If your Digimon dies after a full life and was taken very well care of, it may leave behind an egg. This is what is called a “Traited Egg” and once hatched it will give you an extra 10% of evolving to Perfect. The results are cumulative also, so numerous generations of Traited Eggs will add 10% for each generation. Master Status will not be inherited though. – Evolution is determined by three factors: 1) Care Mistakes, 2) Time Zone of Training, 3) Amount of Battles & Training. The more Battles you fight the better, don’t hesitate to exceed the base requirements. If it says “Train in [time]” focus your training then; you must deplete all DP for it to count. Time Zones are as follows. – If your Digimon is about to Die it has a 50% of coming back to life. – Some Digimon isn’t accessible without a second Pendulum Progress or D-Scanner. When it says the Jogres requirements, the first Digimon is the one in your Progress. So Angemon + Witchmon means YOUR Angemon plus another person’s Witchmon will get you the resulting Digimon. Also, all Jogresses with the Pendulum Progress are just flip-flopped. If you Jogres Angemon with a Witchmon, The Angemon will become Angewomon, while the Witchmon will become Antiramon.